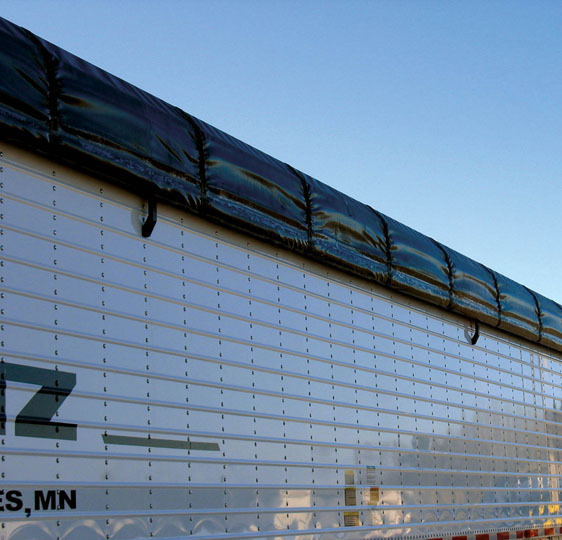 Tarp manufacturers stay up to date with the needs of the transportation industry. Richard Cossette, owner and president of T.R.S. Industries Inc. in Fargo, N.D., expanded his company’s fabric offerings after one of its regular customers—a hauler of multiple food-grade products—requested a more slippery fabric for a roll tarp. “They spent a lot of money washing tarps that were hard to clean because products were sticking to the fabric,” Cossette says. In conjunction with Seaman Corp., T.R.S. Industries came up with a solution called Supreme Clean: an 18-ounce, vinyl-coated nylon with an acrylic lacquer coating. After a little more than a year of using Supreme Clean tarps on 35 trailers in its fleet, the Detroit Lakes, Minn.-based company has ordered another 50 for new hopper-bottom trailers, even though the cost is about 10 percent higher than the price for tarps it previously bought. “We feel, for the long run and everyday use, it’s worth the extra upfront cost,” Foltz says.